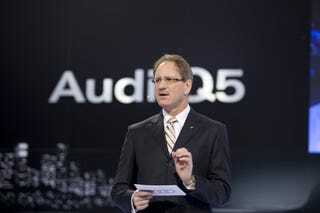 "Nobody will pay a $15,000 premium for a car competing with a Corolla," said Audi of America President Johan de Nysschen. "There are not enough idiots who will buy it." Really? Put your money where your mouth is, Johan. De Nysschen was speaking to MSN Autos about his frustration things were swinging in the favor of gasoline/electric hybrids over clean diesel technology. He believes consumers have been "hoodwinked" into thinking hybrids are the only answer to eco-friendly cars. He described the Chevy Volt as "A car for idiots," before adding sarcastically, "They're for the intellectual elite who want to show what enlightened souls they are." De Nysscen argues that clean diesel could have an immediate impact on national carbon emissions and the overall amount of fuel used, where, in contrast, Hybrids and electrics won't have a demonstrable impact on either for many years to come.